Ticket to Ride - Marklin Edition is the third installment in Days of Wonder's best-selling boardgame series that has won 14 international game awards, including the prestigious Spiel des Jahres. Like its predecessors, Ticket to Ride - Marklin Edition is simple, fun and addictive. Players collect sets of train cards that enable them to claim railway routes and fulfill their all-important Destination Tickets by connecting distant cities. The Marklin Edition also introduces a new Ticket to Ride game play element - Passengers that are used to pick up valuable Merchandise along the routes. Created in partnership with Marklin, the world leader in model railroading, this edition features 118 historical train photographs, each carefully selected from the incomparable Marklin archives. 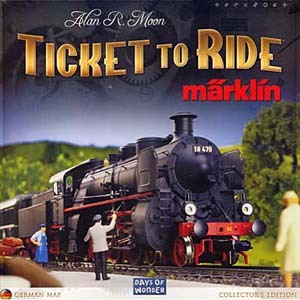 Ticket to Ride - Marklin Edition is a unique opportunity for Marklin enthusiasts to share their passion with family and friends via a fun and engaging boardgame. The boardmap for the Märklin Edition is based on a map of Germany and introduces Passengers and Merchandise to the Ticket to Ride gameplay.